I love traveling. Exploring unchartered territory is one of my passions, and I love to see as much as I can when I’m there. So, before I leave I do some research, things to do, hidden gems, and where to eat and drink (thanks Google). This post is kind of like a Google search from my account: my favorite things to see, eat, and of course, how to dress. Portsmouth blends new and old in a unique and charming way. The main streets are lined with brick and mortar shops, eateries, and many of the allies lead to historic sites or old houses. One of my favorite streets is Washington Street. If you follow it directly, you’ll pass restaurants, street art, old shops, historic Strawberry Banke, and eventually make your way down to the residential areas. Many of these houses are from the 17th century and are still lived in today. They stand out with their traditional architecture, and beautifully maintained, bright exteriors. The view above is of Bow Street, a popular place for waterfront restaurants. From the street, the restaurants seem quiet, but once you walk down the stairs and onto the decks you hear the roar of people. Jordan and I ate at Martingale Wharf, the atmosphere is lively and the view is beautiful. The drinks are creative and refreshing; I ordered a Ginger Lemonade and Jordan had an IPA. For dinner I had seared tuna (pictured below) and Jordan had steak frites. We both loved our dishes, but Jordan’s portions were rather small. Seared tuna over bok choy and Miso broth at The Wharf. I recommend stopping in one of the breweries here, there are so many craft beers to choose from! The list breweries includes Smuttynose Brewery, Portsmouth Brewery, Earth Eagle Brewings, Redhook Ale Brewery, and many more. We didn't have enough time to stop on, but we're planning on going to one during our next visit! 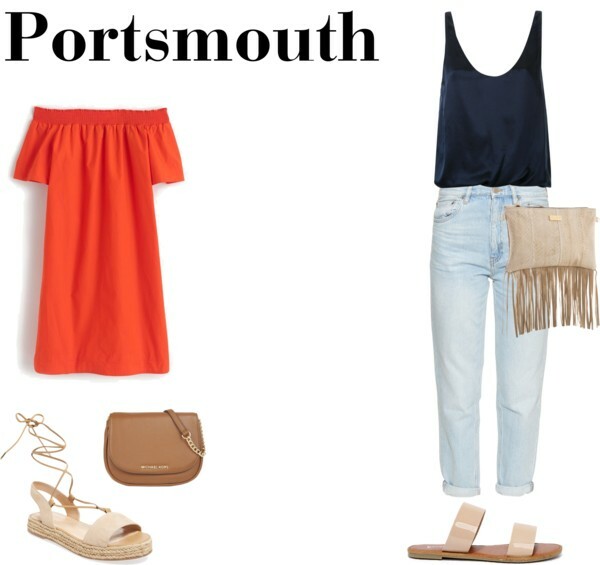 The style in Portsmouth is laid back, and people dress casually. I recommend wearing comfortable walking shoes because everything is accessible by foot. I wore flat sandals with a dress and was fine. A dress with a jean or leather jacket is a great choice because the temperature drops at night. If you aren’t a dress kinda gal, try jeans with an off the shoulder top, and a jacket. For guys, wear shorts with a crew neck top and boat shoes, or jeans and a tee. Pack a jacket for later, because it will get chilly. Jordan wore a short sleeve shirt, shorts and Sperrys and got cold as the sun went down.